Rigid D-Series lights have always been the most versatile compact lighting package on the market. 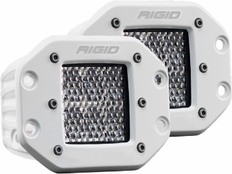 Rigid decided to take things to the next level with the next generation of D-Series lights, Rigid D-Series PRO. Measuring just 3� x 3�, the D-Series packs a powerful punch of up to 4,752 lumens depending on the optics chosen. These lights work great in any application and are commonly used as fog lights, on off road vehicles, in construction, and more.